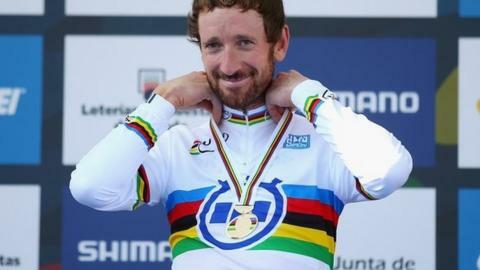 Britain's Sir Bradley Wiggins has signed a contract extension with Team Sky that will see him race for the team until the end of April. Wiggins, 34, is planning to compete in April's Paris-Roubaix one-day race before switching to the track and his bid to qualify for the Rio 2016 Games. "Paris-Roubaix is a special race for me and I'm determined to give it another go in Team Sky colours," said Wiggins. "After that, I can focus fully on preparing for the Rio Olympics." Wiggins joined Team Sky in 2010 and two years later became the first British rider to win the Tour de France. Later in 2012, he added the Olympic time trial title to his accolades, becominge the most decorated British Olympian with seven medals. He was also named BBC Sports Personality of the Year. Last year, he clinched his first World Championships road title with a thrilling time-trial victory in Ponferrada, Spain. That success ensured Wiggins earned Olympic and World titles on both the track and the road. While Wiggins has recorded victories in the Paris-Nice, Tour de Romandie and Criterium du Dauphine stage races, he is yet to win one of the one-day classics, which mainly take place in the spring. Paris-Roubaix is a 250km race that is famed for its cobbled sections of road and finish in an open-air velodrome. "It's one of the toughest races in the calendar and my aim is to improve on my ninth-place finish last year," said the four-time Olympic gold medallist. That was the best performance by a Tour de France winner since Greg LeMond finished in that position back in 1992. No winner of the Tour has won the classic, which this year takes place on 12 April, since Bernard Hinault in 1981. Team principal Sir Dave Brailsford added: "Rightly he still has big ambitions for the future and everyone at Team Sky will work their hardest to make his final chapter with us a successful one."